Ever since J. 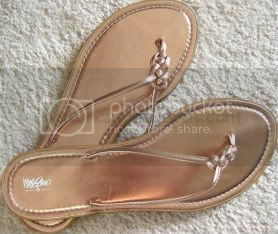 Crew introduced the Metallic Guava color in their leather flip-flops, I've been lemming a pair. They're so simple, yet elegant at the same time. Lovely, no? But at $49.50 (exclusive of tax and shipping) they're a bit steep for such a simple design. So, I put them in the back of my mind to purchase when I hit the big Powerball jackpot. Super cute, right?! They're the exact same color as the J. Crew ones, and I love the braiding detail...and they were under $7.00!! Super deal! I promptly did a little happy dance as I tossed them into my cart and went on my merry little way. I'm really looking forward to getting some use out of these this summer. Of course I went with a kitty theme! Base polish is China Glaze B-Girlz, Leopard Print using Konad plate m57 with silver Konad polish, and Kitty using plate BM04 with purple Konad polish. Not too shabby for my first time, although I will admit there was quite a bit of trial-and-error. Practice makes perfect! Oh, how I love the Tar-jay!! Cute flip flops and pedi! !